"Mobile threat defense (MTD) solutions have matured and can provide value to organizations looking to strengthen their mobile security. Security and risk management leaders should leverage MTD to address evolving mobile security needs." Mobile Threat Defense solutions have graduated to become an important part of enterprise security architectures. Enterprise organizations are embracing cloud solutions to perform central work tasks. These solutions house sensitive corporate data, which employees can access from any endpoint, including mobile devices, from any network. A corporation’s traditional perimeter security, in this new world of work, no longer applies. Enterprises have a new mandate to protect data from threats and risks that are unique to this work-from-anywhere environment. Introduce MTD solutions gradually. Adopt MTD solutions sooner in high-security verticals, with large Android device fleets, or in regulated verticals, such as finance and healthcare. Leverage app vetting and device vulnerability management MTD functionality first to demonstrate immediate value to the organization. If legacy security technologies no longer apply, then a few key things become true: devices cannot be trusted and security must move to the endpoint. 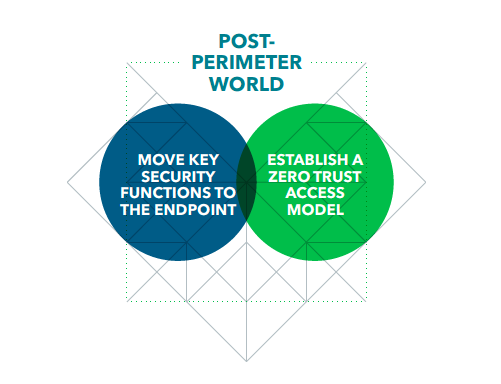 Lookout calls this combination of on-device monitoring and zero trust, “post-perimeter security.” Post-perimeter security requires continuous conditional access to constantly monitor for risks on the device and stop an employee from accessing and authenticating to an enterprise’s cloud services when risks are present. Though they might not always be communicated, the risks are real. Attackers are taking advantage of the fact that legacy security technologies cannot properly address this new post-perimeter world. Specifically, mobile phishing continues to be a main concern for enterprises and remains a largely unsolved problem due to mobility. Year-to-date in 2018, 50.8% of Lookout users with Safe Browsing turned on encountered a phishing link. That could be half of an enterprise’s employee-base. Regulated industries have an added layer of pressure to adopt MTD solutions in order to ensure that all endpoints are compliant with varying legislation. These industries include finance, healthcare, manufacturing, and others. “Compliance is another frequent use case. Gartner clients sometimes suggest the reason they are looking for an MTD solution is regulation-related or related to the recommendations of an audit,” Gartner states. Businesses, regulated or not, who are interested in learning more about potential compliance risk (especially in light of new regulation such as GDPR) should take this Mobile Risk Assessment. As MTD solutions gain more maturity in product offering, enterprises ultimately win. The risk landscape is real and requires action from security leaders. Though mobile attacks may not be making headlines every week, threats are often underreported. The new post-perimeter age of work demands a new kind of security. Lookout Mobile Enterprise Security addresses all of these challenges, securing corporate data and handling risk. Want to learn more about how Lookout can security your data in a post-perimeter world? Contact us today. (1) Gartner, Inc. “Market Guide for Mobile Threat Defense” by Dionisio Zumerle, John Girard, October 30, 2018.